Though many people opt to get married in the sunny warmth of summer (especially here in WNY), fall weddings open up a whole world of seasonal possibilities to make your day memorable and unique. We’ve put together some of the coziest, coolest and creative trends in autumn weddings to help you plan a spectacular celebration that you and your guests will love. When it really comes down to it, the food at your wedding is one of the most important things to your guests. And fall gives you an opportunity to wow them with creative, delicious, seasonal menu options. Soup! Take advantage of the cooler weather and serve one or several autumn soups. From creamy pumpkin soups to chowders to rustic vegetable or french onion soups, your guests will love the opportunity to indulge. Or, if your heart is set on salads, try to an autumn inspired salad with roasted vegetables, seeds and fall berries. Potpies. Yummy comfort foods are always a hit. Food and Drink Stations. A coffee bar with a bona fide barista to make your guests their favorite concoctions. A soup bar. A churro station. A crepe station. Serve up your favorite foods and appetizers at designated stations, ensuring your guests are never far away from something delicious. At a wedding, desserts are in a class by themselves, separate from the other food. Gone are the days of a massive wedding cake serving as dessert for the whole party. You’ve got options, and now is the perfect time to indulge and take advantage of them. Translucent cakes. Naked cakes were in last year (cakes sans icing), this year it’s translucent cakes, covered in just enough icing to remind you that frosting is great, but not so much that you can’t see the layers coming through the thin layer. Pies, pies pies. Fall is the perfect time for pies, with late-summer or fall fruits typically being ideal for baking anyway. Why not try a pie bar in place of the standard cakes? Alternate Cakes. Chocolate is great, and red velvet has its place, but they’re not your only options. Carrot cake is perfect for fall, and cheesecakes are a pleasant surprise alternative. You can even opt for a donut or brownie tower or a fanciful croque em bouche. Mini desserts. Why limit yourself? Serve up a trio of dessert miniatures – pies, donuts, brownies, even – wait for it – candy or caramel apples. Is there anything in the world better than fall desserts? The colder weather and changing leaves mean you can take advantage of some really dreamy colors, fabrics and nature-inspired decorations. Very Rustic. Think burlap and lace. Very luxe. Think velvet and metallics. Seasonal foliage. Adorn the aisle with grapevines or ivy. Feature centerpieces with apples and pears, and bouquets with dark dahlias and sprigs of berries. And of course, nothing screams “autumn!” quite like pumpkins and squash. Embrace Fall Colors. Summer may get the bright pastels, but fall gets the deep, rich, elegant hues. Think dark reds and burgundies, purples, browns, deep oranges and saturated yellows. Candles. Whether you’re going rustic, luxe or somewhere in between, candles are classic decor that you’ll never regret. Right now, large pillar candles are favored over dozens of smaller tea lights or tapers. Texturize it. Texture is everything right now. Ruched tablecloths. Wild bouquets. Velvet on top of taffeta. Intriguing ultrasuede or linen. A great party is in the details. Spice it up. Hey, if Starbucks can make everything pumpkin spice, you can too. Cloves, ginger, allspice, nutmeg – the flavors of fall. The Flowers. Dahlias are a fall hit and come in many darker, rich colors. The wildflower look is still in, so get a little untamed with ivies, berries, wispy greens and even ferns. 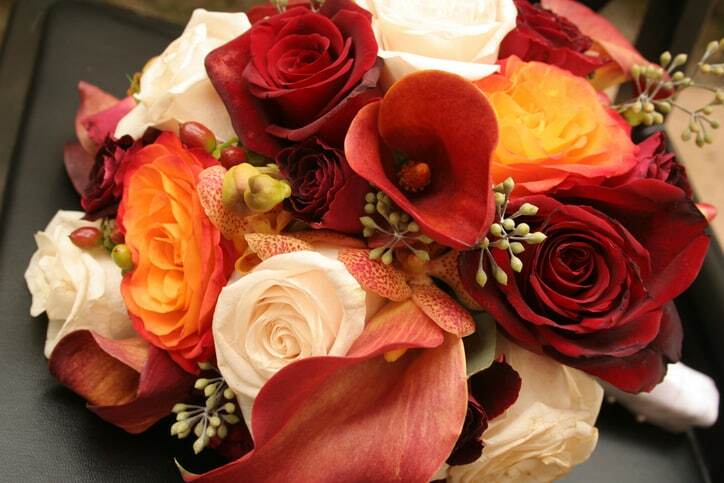 Darker-hued roses are perfect for an elegant fall ceremony. Homemade Favors. There are so many great foods of fall. Little bottles of homemade maple syrups or jams are a favor that your guests will not only appreciate, they’ll actually use them! The lighting. Fall lets you get more creative with lighting (especially since it gets dark earlier). Mood lighting that transitions with the party can help let your guests know when it’s time to sit for dinner, turn attention for the toasts, or hit the dance floor. The dress. We didn’t forget about this “tiny” little detail. Two piece dresses are the hit of the season, with warm, luxurious cashmere sweaters and long, full skirts.